Squats - you used to do it right...what about now? 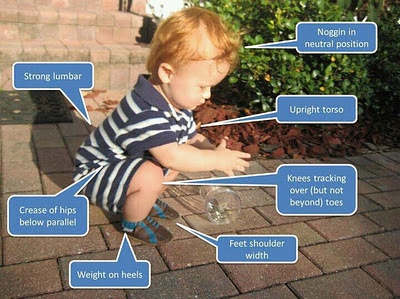 As soon as babies can stand, they start to learn how to squat. I remember my kids standing and then squatting so they don't topple over. Babies have fantastic flexibility and their brain is eager to learn new motor patterns...where did it all go wrong for most people? What do you need to do a good squat? Flexible but well controlled feet: You need to be able to hold your foot into a neutral position, not rolling in or out. So many people are focused on keeping their knees out that they roll out their weight to the outside of their feet. You need to keep the 26 bones and 33 joints of your foot nice and mobile. Older people who come from cultures where squatting is common do so until they die - it is only a matter of practice! Good ankle flexibility: Wearing heels, sedentary lifestyle and/or too much exercise without stretching has meant that your calf muscles are probably tight. You need good length in the muscles and good joint flexibility so you can keep your centre of gravity over your heels. Good knee strength and flexibility: Your knees need to be able to bend your knees at least 130 degrees to do a full squat. The knees are ultimately subject to the rotational forces generated by foot/ankle as well as the hips. Good hip strength and flexibility: Controlling the hip should be easy but we tend to make things harder than they need to be. It is easier to bend from our backs because we slouch a lot. Also, our normal lives don't require us to bend more than 90 degrees of hip flexion so our body, in its efficiency, decreases the amount of flexion we have - use it or lose it!! Strong spine aka "core" or "midline": Without the ability to maintain control of every joint in the spine will likely lead to a bend in your back and so pressure onto your spine and discs. Leah demonstrating an air squat which then can be progressed to a front squat, back squat and overhead squat. This photo was taken at www.crossfitfx.com by Antony Lo for www.physiodetective.com. Start in standing with feet either under your hips or as wide as you like. As you go down, keep the line of your femurs (upper leg bone) pointing the knee the same way as the feet are pointing. This is one of the most important points about squats!! Go down as low as you can keeping the weight on your heels and your back straight. Leah demonstrating an incorrect air squat in which the knees are past the toes vertically and her back is too upright. She also demonstrates a rounded lower back and tight hips. 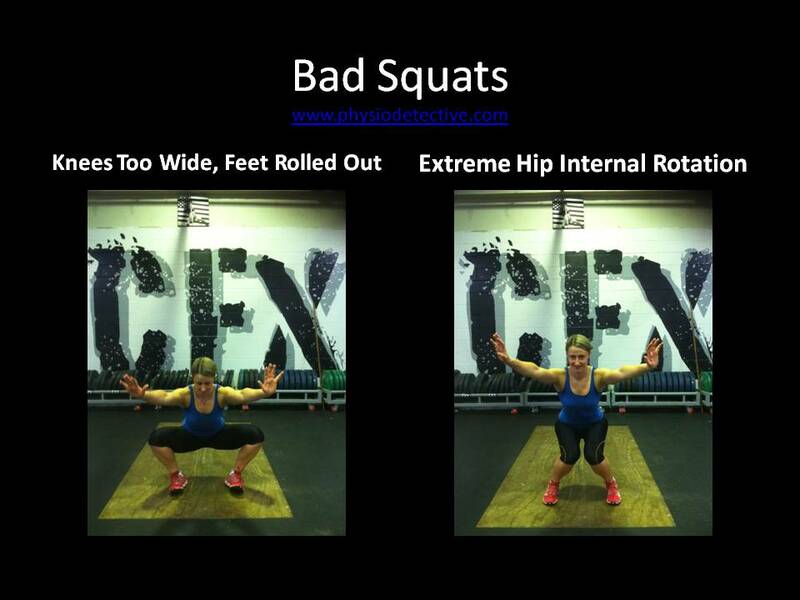 When these problems are progressed to a front squat, back squat and overhead squat, injury can occur. This photo was taken at www.crossfitfx.com by Antony Lo for www.physiodetective.com. Leah demonstrating an air squat which has decreased ankle range of motion which leads to her tipping forwards from the hip to keep the weight over her heels. She also demonstrates weak hips allowing her knees to internally rotate (roll in) such that her knees are pointing inside her feet. When these are progressed to a front squat, back squat and overhead squat, it becomes difficult to do squats under heavier loads. This photo was taken at www.crossfitfx.com by Antony Lo for www.physiodetective.com. Leah demonstrating an air squat which is very tight in the hips causing her feet to roll out and the knees to point outside of her foot direction. She also shows the results of having very weak hips which basically force the knees together. When these are progressed to a front squat, back squat and overhead squat, the extra weight will grind away at the feet, ankles, knees and hips and cause damage. This photo was taken at www.crossfitfx.com by Antony Lo for www.physiodetective.com. What if you can't do squats properly? 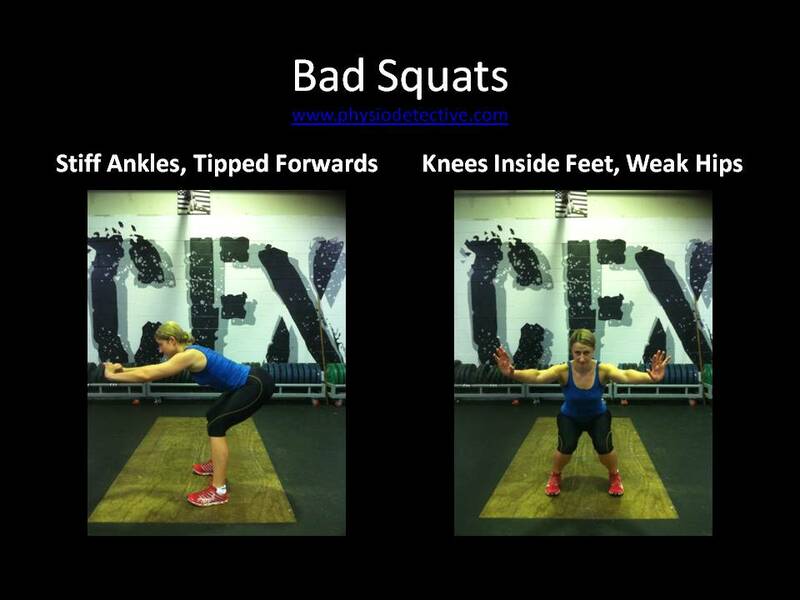 If your squats look like some of the bad ones shown above, then you need to find out why you can't do them as well as Leah can. Maybe you have tight hips or ankles, weak back or hip muscles. Maybe you have short calf muscles. Maybe you have the strength and flexibility but not the coordination to put it all together. Who knows? The only way to make your squat better is to see someone who knows what they are talking about. 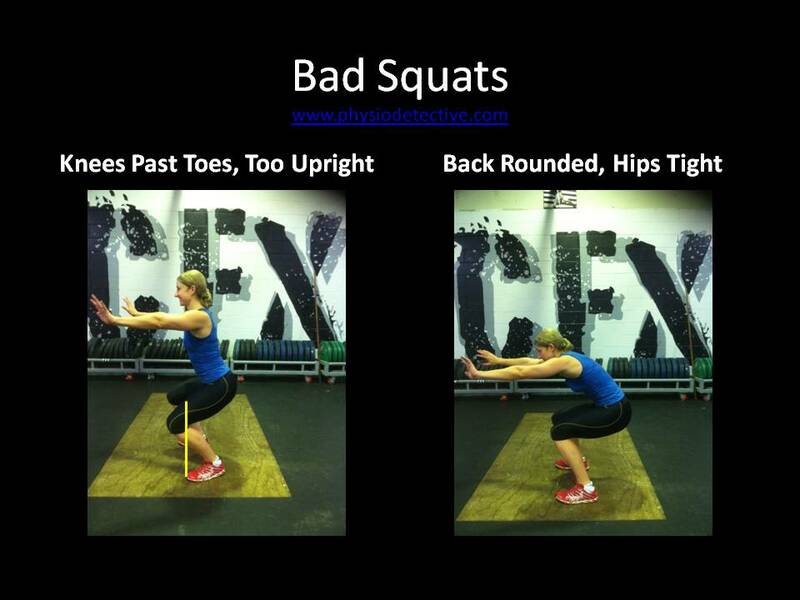 Everyone you show this article will agree that the photos above are bad...but are they telling you when you squat badly? if they aren't, ask them "why not?". If you don't get a good answer, change trainers! Do you want to end up like Brandon Roy (see a previous blog post on how his knees are shot to pieces by the age of 27)? Squats are so essential in everyday life. Most of the time, we are too tight somewhere to do a full squat so keep working on your joint and muscle and nerve flexibility so you can lift safely. How do you do your squats? Do you have any questions? Please post in the comments below! Why Do Injuries Seem To Occur With Crossfit? 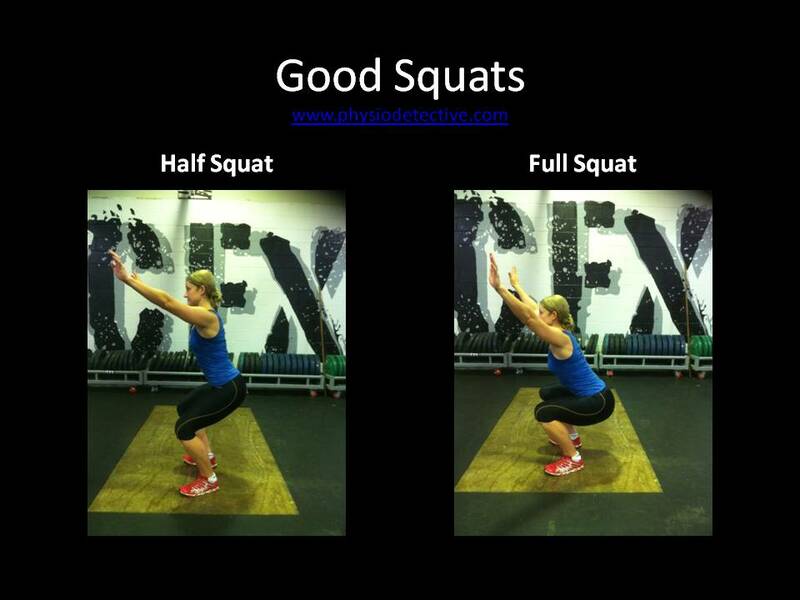 Being new to CrossFit I am learning all about the importance of a good squat. And it was there that I was introduced to the idea that kids do it well and then we often lose the ability. Any tips on helping kids keep their flexibility? Sorry about the late reply Brett. I think the best advice is to get the kids to keep doing what they can now. They are so flexible and relatively strong so it is a matter of maintaining what they have. If they stop doing proper, full squats, then it is hard to get them back again. I have a small kettle bell for my kids to use. For your kids, you could just carve a piece of wood so they think they are using a kettlebell! Congrats with the Crossfit – keep at it!! A comprehensive analysis! One thing that is important with squats also is a strong, intact pelvic floor. I would like them to engage (or brace) Tr Ab and pelvic floor prior to the squat. If a woman (or man who may have rectal prolapse) has vaginal prolapse then I would caution about doing such a full squat. Modifying the position would help such as against a wall and not going into a full squat. If women are gardening I recommend 4 pt kneeling on a kneeling pad, particularly if they have had repair surgery rather than squatting to weed the garden. hi Sue – in general, i assess people on whether they need cuing or not. I generally do this in a lower load situation to find out what their strategy is. The thing that I have found over the years is that some people, not everyone, actually do better without the conscious brain getting in the way. The key is testing this! As for women who have had surgery or have a prolapse, squatting is not the first choice exercise for them but my goal is still to progress them to this higher load activity!! I have a physical job (housekeeper). Yesterday, just for fun, I counted how many squats I did during work, that is over 300. (squats like the child in the picture). It helps me focus on good postures. The thing is, before my pregnancie, squats were easy for me, and then as my belly grew, my hips got tight and of course I had to widen my legs in order to squat (like in the picture of the wide knees, but my feet were not rolled out). Now, my body is back to normal, but when I squat I need to make an effort (It’s been 4 months since the delivery), and my hips are still tight. I tend to avoid squatting when I’m picking up something on the floor, and that is not good. Maybe I’m doing something wrong, so it’s a good idea to have someone look at that, because this simple movement is essential to me.